Bu chòir companaidh adhair ùr a stèidheachadh a bheireadh seirbheisean nas fheàrr do mhuinntir eileanan na h-Alba agus Tìr-Mòr. Sin beachd fear-gnìomhachais à Steòrnabhagh, Tormod L. Dòmhnallach. An dèidh ghearainnean mu sheirbheis Loganair, tha e a' moladh gum bu chòir do chomhairlean agus bùird shlàinte thighinn còmhla agus na seirbheisean a ruith iad fhèin. "'S e cùis nàire a th' anns an t-seirbheis a th' ann," thuirt Mgr Dòmhnallach. "Daoine a dh'fhaodadh a bhith ann an cunnart, seann daoine, clann, daoine a tha ag iarraidh a dhol gu coinneimh ospadail 's am plèana air a dhol "teicnigeach" mar a theireas iad 's iad air a' choinneamh a chall. "Ma tha coinneamh ghlè chudromach agad ann an ospadal 's gun caill thu e 's gum feum thu an uair sin feitheamh dà mhìos eile, tha sin a cur uallaich mhòir dha-rìribh air mòran dhaoine," thuirt e.
Dh'fhaodadh, fo na molaidhean aig Mgr Dòmhnallach, gum biodh na bu lugha de sheirbheisean ann, ach bhiodh plèanaichean nas motha ann, agus faraidhean nas ìsle airson luchd-turais cho math ri daoine a bhuineas dhan sgìre a bhrosnachadh. Tha e ag ràdh gum feumadh an t-seirbheis subsadaidh, ach tha e misneachail gum pàigheadh i air a son fhèin. "'S e na tha a dhìth oirre, dha-rìribh, daoine a bhith a' suidhe sìos 's ag obrachadh a-mach nam figearan," thuirt e.
"Gus am faic iad gu dìreach na tha a' dol air adhart. Oir an-dràsta tha seirbheis againn nach eil math gu leòr. "Saoilidh mi gur e fear de na rudan a b' fheàrr a thachradh sna h-eileanan seo gum biodh seirbheis mhath againn, agus gnìomhachas math turasachd. "Mura h-urrainn dhuinn seirbheis adhair a ruith dhuinn fhèin, feumaidh gu bheil dìth mòr oirnn. "Tha na daoine an seo againn sna h-eileanan seo, agus air Ghàidhealtachd a ruitheas an t-seirbheis seo gu ceart, agus bu chòir cead a bhith aca sin a dhèanamh." Aig a' cheart àm tha an Comh. Aonghas MacCarmaig a' dèanamh coimeas eadar seirbheisean an là an-diugh agus na làithean nuair a bhiodh e a' siubhal air ais 's air adhart air plèanaichean viscount nuair a bha e na oileanach. "'S e itealan leathann a bh' ann, le dà shuidheachan gach taobh," thuirt Mgr MacCarmaig. "Rùm gu leòr dha mo chasan. "Mòran rùm airson bagannan a stòradh - gun chuingealachadh sam bith air na dh'fhaodadh tu a thoirt leat de bhagannan. "Bu choir dhuinne sna h-eileanan a bhith ag amas air gum bi an t-seirbheis againn nas fheàrr a h-uile bliadhna - agus tha cùisean air tuiteam air ais. "Tha an t-seirbheis a th' againn an-dràsta fada nas miosa na mar a bh' againn roimhe. "Gun teagamh, tha barrachd sheirbheisean ann. Ach tha sinn mar sgadain ann am baraille sna plèanaichean seo," thuirt e.
Tha Mgr MacCarmaig ag iarraidh air Riaghaltas na h-Alba taic-airgid a thoirt don chompanaidh adhair - ged is e companaidh phrìobhaideach a th' ann an Loganair -airson plèanaichean ùra a cheannach. "Feumaidh seo a bhith againn," thuirt e.
"Ma tha beatha reusanta gu bhith aig muinntir nan Eilean, agus ma tha dùil gun tèid againn air beatha a phàigheas a bhith againn an seo, feumaidh sinn seirbheisean math. Tha sin riatanach. "Chan eil mise idir an aghaidh na drochaid ùire thar Linne Fhoirthe. Tha e riatanach. Tha e air mòran airgid a chosg - airgead a phàigh a h-uile duine an Alba. "Mar sin, tha am prionnsabal ann, agus chan fhaic mi adhbhar sam bith nach gabhadh am prionnsabal sin na h-eileanan air fad a-steach," thuirt e.
Thuirt fear-labhairt buidheann còmhdhail an Riaghaltais gun robh na comhairlean eileanach agus Hitrans ag ullachadh aithisg air seirbheisean adhair, agus gun robh iad a' feitheamh toradh an sgrùdaidh sin mus dèanadh iad co-dhùnadh air taic-airgid air an son. 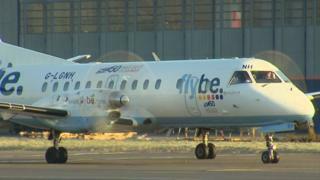 Thuirt e cuideachd gun robh goireasan einnsinnìridh nas fheàrr aig Loganair a-nis, agus gun robh iad an dòchas gum faiceadh an luchd-siubhail piseach air an t-seirbheis ri linn sin.